The Supreme Court ruled in 1954 that segregated schools were unconstitutional. The landmark case Brown v Board of Education of Topeka took on the “separate but equal” doctrine that created segregated public and private facilities in the United States. Segregated facilities became the law of the land in 1896 after the Supreme Court ruled in Plessy v. Ferguson. In that case, Homer Plessy, an African American man, was arrested for riding a Whites only railway car in Louisiana. Plessy argued that this was a violation of the 14th amendment–only enacted in 1868–which gave equal protection under the law. The Supreme Court rejected this claim, arguing that enforced racial separation was not necessarily stigmatizing. The opinion also stated that “If one race be inferior to the other socially, the Constitution of the United States cannot put them on the same plane” . In other words, the Supreme Court argued that Black people were inferior to White people, and the Constitution could not just erase that difference. As a result, “separate” (segregated) facilities were seen as appropriate and legal as long as other, “equal” facilities were provided. This notion held until a group of 13 Black families filed a class-action lawsuit against the Board of Education in Topeka, Kansas. The families wanted to enroll their children in their local neighborhood schools, but could not because the schools were designated as for Whites only. The District Court of Kansas ruled in favor of the school district, citing the “separate but equal” doctrine. But when the case reached the Supreme Court, it was ruled unanimously to overturn school segregation. The Court’s opinion stated that “We conclude that, in the field of education, the doctrine of ‘separate but equal’ has no place. Separate educational facilities are inherently unequal” . Today, schools are of course no longer segregated by law. So, they are not “separate” in that sense (but more on that below). However, as it relates to school suspension rates, they are indeed unequal. Black children are much more likely to receive out-of-school suspensions than other children, especially White children. Overall, K-12 (kindergarten through high school) suspension rates have at least doubled in the United States since the early 1970s . It is important to note that all American children have had to face this sharp increase in disciplinary action. Zero-tolerance policies impose harsh and inflexible penalties on students often for very minor infractions. It might be assumed that suspension only occurs for serious or dangerous incidents, such as possession of weapons or drugs. In fact, such cases only comprise 5% of suspensions. Other common reasons include disobedience, disrespect, and attendance issues (e.g., cutting class or tardiness). And, suspension rates are increasing despite the fact that the evidence shows that suspensions do NOT reduce disruption or improve learning environments. There is no evidence that suspension is effective in: lowering rates of disruptive or violent behavior; improving overall school safety; improving overall school climate; increasing graduation rates; creating gains in academic achievement; or creating gains for suspended/expelled students . Thus, for all students, suspensions are an issue of concern. But, this issue is most problematic for Black students. The largest increases in suspensions have been for Black students, Black students have the highest overall rate, and they face suspension for different behaviors. For example, research shows that while White students tend to be suspended for behaviors such as smoking, vandalism, and leaving without permission, Black students tend to be suspended for disrespect, noise, and loitering . Losen and Skiba’s study examined suspension rates in middle school, a critical time for a child’s future academic success. Looking at data from 18 urban school districts that included many major cities such as Los Angeles, Baltimore, Houston and Seattle, the researchers found that Black students consistently had the highest suspension rates. 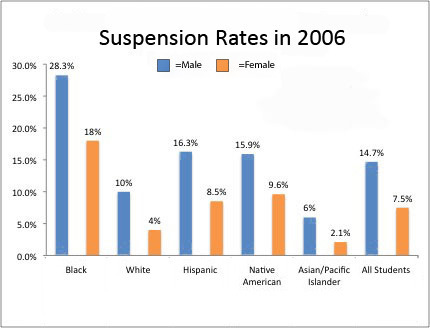 This chart (recreated from Losen & Skiba’s original graphs) shows that Black students, both male and female, had the highest suspension rates for middle schoolers in 2006. The graph shows the percentage of students of each race that were suspended during that year. Note that for students of all racial backgrounds, males (blue bars) have higher rates than females (orange bars), which could be expected. However, Black females even have higher suspension rates than males of any race. The table below shows the top suspension rates for Black students by school district. The numbers are the percentages of Black students who were suspended at least once in these districts. Other data show that Black students are disproportionately suspended. As reported in the New York Times , data released from the U.S. Department of Education show that in 72,000 schools across the country, Black students were 39% of all suspensions, even though they are only 18% of the student body in the schools that were studied. And, Black students are 3.5 times more likely to be suspended or expelled than White students. The graphs in the next two posts show the disproportionate rates in different cities. We chose these cities because they are major cities in the U.S. or because they have been identified as among the best (or worst) cities for Black children with regard to neighborhood environment . Environment was based on indicators such as segregation levels, income levels, poverty levels, home ownership, and more. The suspension data come from the U.S. Department of Education, and are available online . Across this wide variety of cities, Black students are suspended at far higher rates than they should be considering their percentage of the student body.